In this epoch of advanced technology, the church management staff must take advantage of all the opportunities offered by the various software solutions developed for this area. The managerial duties of a priest have become very complex, including not only sermons they hold, but also controlling finances, organizing summer schools, offering guidance to their parishioners and many other activities. However the most important of all is the care a pastor shows to his parishioners, because all the other tasks are made for the parishioner’s spiritual growth. It is desirable that a pastor who is devoted to the activity he conducts know, as well as possible, the church members and visitors, their desires and problems, in order to help them in any way he can. Specialized software for managing church attendance offers multiple possibilities. With it you can keep a record of people who attend the Sunday service and Sunday school at various activities carried out by groups within the church, the people who were invited by other members of the community and how often they come to church. 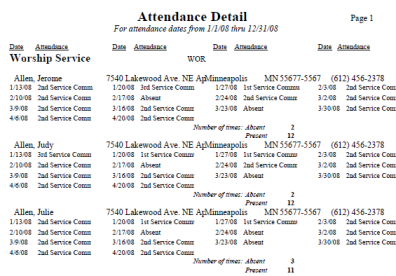 You can also print reports showing how many people attended the service or other activities in a certain period of time. This way you can easily see the evolution of your church, check wether church attendance has increased or just the contrary and if some of the visitors have become permanent members. Also, using church attendance software, church leaders can see if some of the parishioners have missed from several services, and if contact them to see if they have experienced any kind of problems; this shows the care and the interest the pastor has for each and every member of the community. In respect to visitors, church leaders can easily follow their participation at services or other church activities, and if they show a true interest for the ministry, the pastor can decide to contact them by e-mail, phone or even make home visits to invite them become members of the ministry. With church attendance software, pastors can follow the voluntary activity of their parishioners, see the activities they have participated in, the actions where they have offered their aid or help. Church attendance software programs hold records which offer the possibility to see a person’s entire history, by means of a simple query. The recorded information about people ’s church attendance can be used as statistical data with the help of which the church staff can develop diagrams, histograms, or other means of visualising how the church develops in a certain period of time. If you notice that there was a drop in service attendance, at the voluntary actions, or that the number of visitors decreased, you can make a deep analysis of the possible causes and take the appropriate measures to increase people’s interest for the congregation. You can also send personalized invitations to each person to invite them participate at various events. An interesting tool for keeping track of attendance is CMS Attendance. By its detailed report you can see individual attendance history, consecutive absences over a certain period of time, total participation for worship, Sunday schools, Bible studies or other events. 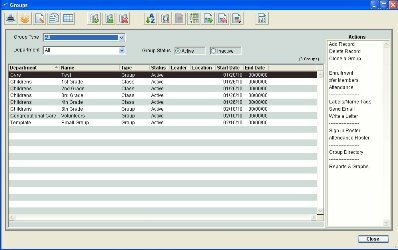 The programs is pretty easy-to-use, anyone can rapidly add new entries, print reports or move attendance history from one group to another. By the Book is a church software solutions provider that offers a very modern and flexible attendance reporting tool called RollCall. Reports will be displayed in a graphical format for each member, but you can also see as a complete list with all congregation members. Users can set their own parameters, depending on the number of weeks or months they want to check the presence or absence of people, the service they want to take into consideration or other criteria. Recording presence is simple: just click on the name of the individual who was present at the desired event and an ‘X’ will appear in front of their name. You can quickly scroll through the list of members by using the "type ahead" feature. You can download a free trial at http://www.bythebook.com/church-management-software/try-it. For tracking Sunday School classes, Bible studies groups or other activities of this type, you can use a specially-designed tool called Easy Sunday School Administrator. This small program (only 6Mb) is enough to maintain a database with all members, a meeting schedule and class names all in one place. You can keep an unlimited number of records for your members, containing information such as their names, addresses, e-mails, birthdays or class names. Viewing records about the participants and absentees is very straightforward. 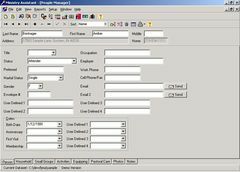 You can also export a person’s attendance history screen to Microsoft Excel, perform a spell check on your records, back-ups and restores for data to a .zip file from within the application. 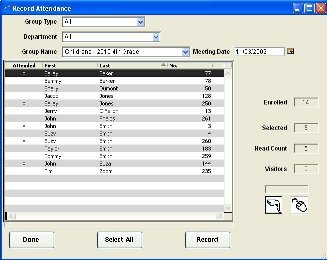 Only 2MB of memory are sufficient for Ministry Assistant to offer sufficient functionality for an efficient attendance tracking in small group structures. 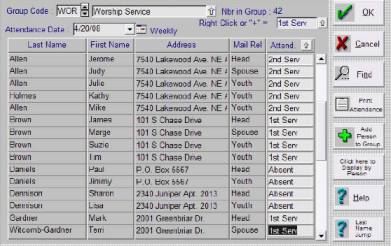 The program has many important features, such as: maintaining personal information on church members, including their picture, as well as church groups, ministries within the church, information on different events and activities that take place within the congregation, keeping reports on member and visitor attendance to services, meetings, classes, seminaries or other events and saving those reports to a large number of file formats, mail-merging and built-in e-mail to individual members or groups.